About a month ago I was all excited about the Nook Tablet and how there was a loophole in the code that let you install third party apps. Today B&N punctured that balloon with the latest Nook Tablet update. I have confirmation that the NT v1.4.1 firmware update for the Nook Tablet has closed the loophole. B&N's walled garden just got a little smaller. I have to say that I am really disappointed in B&N. Shortly after I found that loophole, I got a few hints from B&N people that it was probably part of an intentional design. It let the few who wanted to bother with finding apps elsewhere install the apps while not affecting the many who didn't care. Of course, these were the same sources that said the Nook Color would be getting the same loophole (it didn't), so clearly I shouldn't be listening to them. When I announced that I was returning my Nook Tablet I got into a long an interesting discussion over whether I should have kept the NT and hacked it. A couple readers that I should keep it because it was hackable and thus B&N's restrictions could be bypassed. I returned it because I didnt want to have anything to do with B&N's walled garden, and I didn't want to fight with B&N over who owned the tablet. Well, today B&N showed that they actually are fighting for control of your tablet. My post wasn't hyperbole; it voiced a real concern. As annoyed as I am with B&N, I'm also a little pleased to have been proven right. This is going to end up being a major strike against the Nook Tablet. Why buy a device that you have to root before its really useful when you can get the KF and have more functionality for a much lower price? Sure, the KF has some software issues and Amazon has even blocked some reading apps, but at least with Amazon you know you won't need their permission to install apps. 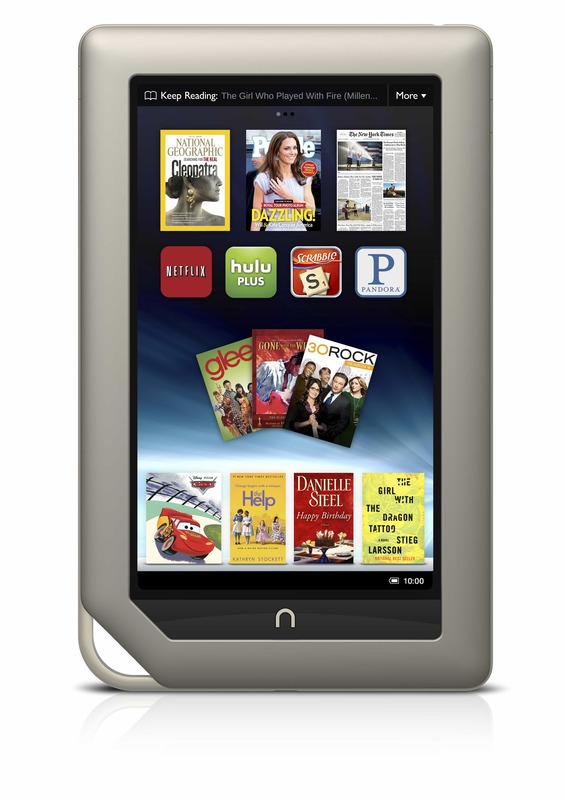 In any case, if you're annoyed by this update, you can make your feelings known by returning the Nook Tablet. Thanks to B&N's generous returns policy, you have until 31 January 2012 to do so. Archos 70B Android Tablet Coming Next Month for $199 – Vox Killer? In my opinion people like us tend to overestimate the importance of being able to sideload apps. If you look at B&N’s Nook boards you will see that the average Nook user does not even sideload ebooks, because they find that too difficult. There is a very small minority of users who want to be able to install APK files, but the majority of users do not know what APK files are, do not care about APK files, and will never install one, even if it would be an official feature. The same is true, in my opinion, for the Kindle Fire. Yes, the Kinde Fire allows you to sideload apps, but even more than Nook users Kindle users are used to Amazon supplying everything to them, so that they do not have to do anything themselves. Once again the majority of Kindle Fire users do not know what APK files are, do not care about APK files, and will never install them. These devices are not aimed at people that want to use them as full tablets, and want to sideload apps. They are aimed at people that are perfectly happy with the “walled garden”, and are glad they do not have to know anything about the technical side of things, and do not need to have any IT knowledge. People that want to use these devices as full tablets are not an important group of users for B&N and Amazon. I think the real target of these moves is app developers. They’ve already distributed millions of nook tablet and nook color devices- now they just need to build out an ecosystem so existing owners don’t get bored. And shutting down rooting- at least temporarily, helps them do that. I believe the effort required to get an existing android app in the nook store is fairly minimal for most developers- and I’m sure there are enough users out there to make it worthwhile. The problem is that a good percentage of nook color and nook tablet owners are already being reached via rooted devices and/or sideloading- and that means the nook store slips down the developers to-do list. But I’m biased- I just want people to upload their apps so I can buy them on my nook color- and I’m too lazy to root in the first place. Oh, no question that the people who buy Nook Tablets don’t care about sideloading arbitrary apps. That’s why they ended up with NTs, after all. The issue is about those that *do* care and will simply buy something else. The problem for B&N is that there are zillions of Android phone users who *do* know what apps are and *want* to run the same apps on their tablets as on their phones. And those folks are more likely to go with a FIRE or a telco tablet than a Nook. They should’ve stuck with the NC mantra: “it’s a reader, not a tablet”. I just bought a Nook Table w/Glowlight. The software version is 1.1.5. Can this version still download apps. My wife has a Kindle and I want to put that app on my Nook so I can access those books. Or, is there another way to access those books on my Nook? Thanks for the confirmation. When I returned my NT, the folks at the B&N store said I shouldn’t worry about updates when I expressed my concerns about full use of the NT. I told them that if they turned out to be right, I could come back and buy another one. This is just sad, really. Nice little tablet, my library books worked great running the Kindle app (the Nook app wouldn’t open books from my public library), and it has a good memory. When BN is fighting tooth and nail with Amazon, they can not afford to tick off any base of users, let alone the tech crowd. I think this is a bad decision on their part. Let’s take the opposite view: if they are only caring about the non-tech crowd, why close the hole for the small, insignifcant tech crowd? It reminds me of the early PC vs Mac days when Apple catered to the user-friendly crowd, and IBM made it easier for the tech crowd. Most users asked their tech friends which computer to buy, and most if not all, recommended PCs. The early Macs did not stand a chance and their sales showed. Nowadays, I get many questions on which ereader to buy, and I wouldn’t recommend the Nook due to these poor strategies. BN can not afford to allow sales to go to Amazon from their loss led device either. What’s the first thing everyone says in the same sentence they talk about rooting/moding a NOOK? Adding the Kindle app. How does it help BN to sell their product at a loss and then have customers run to spend their money at their chief competitors? Most average users don’t need the tablet for the bells and whistles that you’re looking for…also be aware, when people return these tablets, because you want to get “back” at the name of B&N, that’s revenue taken back from the store you bought it from, which hurts the employees, most who are people that the recession has already hit hard and just needs a paycheck, but no. Please return the device because it doesn’t wash your car and walk your dog. It just does what it was advertised to do. It does not do what it was advertised to do, no. I was at the press conference and y’all were just a step away from lying. It’s not nearly as open as you led us to think; it’s not nearly as capable as you led us to think. It’s one thing to not have the ability to side load from the start, it’s something totally different to actually take functionality away. They just made Nook Tablet a lot less appealing. I talked with BN rep about my nook tablet, they stated Amazon makes millions of dollar from all types of products and they can afford to sell things at a lesser price. I care about this because????? BN for the most part charges 25% or more on their ebooks, part of their marketing ploy was you could download books from the library. Although I am not a tech, I will find someone to root my nook tablet. Amazon has far better products. Sorry BN you loose! It is TOO easy to root the nook [color or tablet, I have the color]! Anybody who can use google search can do it. Root the nook, install the Android market, install B&N’s reader (if you must). Put any OTHER reader on it that you like… (Kindle reader, Aldiko reader). Then enjoy your WONDERFUL device. It plays Netflix content like a champ, the battery life is GREAT, and you can get ANY program you want from the market rather than being restricted to B&N’s petty little pile of stuff. You only need ONE other program from the Android Market and it is called “Button Savior.” With this you can FULLY LOVE your nook color. I have been loving mine for six months now. Cheap to buy, HIGH quality. What more could you want?